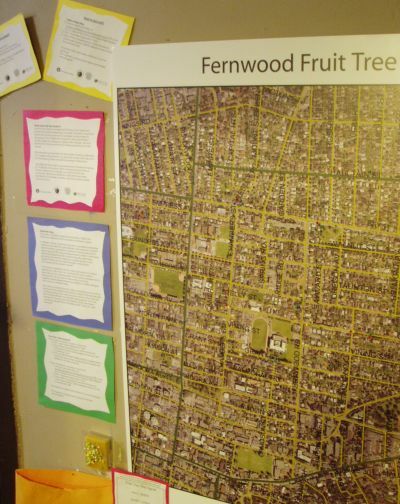 Starting in the summer of 2007, Fernwood Fruit Tree Project participants will harvest fruit and berries from trees and bushes in our community that would otherwise go to waste. The food will be distributed equally amongst home owners, volunteers, food banks and community organisations. This project is part of the Fernwood NRG Harvest Project, a project that promotes local food sustainability. We will be putting on canning, preserving and drying workshops in the fall of 2007 so community members can enjoy local food all year round. This is the first time that the LifeCycles' Fruit Tree Project has been implemented at a neighbourhood level. Common Ground is assisting with the production of an interactive wall map to be set up in the Cornerstone Cafe. This base map will enable community members to identify fruit trees and berry bushes growing in Fernwood. Common Ground will assist with mapping workshops during the summer and fall!